The film is also very…odd. It is based on the enormously popular young adult horror-romance books by Stephenie Meyer and has vampires in it, but these bloodsuckers are never once truly fascinating creatures. Moreover, I never once truly understood the motives of these beings. Consider this: If you were a 107-year-old nausferatu that was doomed to live forever as a 17-year-old and is made socially impotent by being around normal flesh and blood humans...then why would you bother going to high school? Really? Why? Furthermore, what would be the point of endlessly repeating the same class and school experience indefinitely? I would rather drive a steak through my own heart before repeating Grade 11 Physics over 100 times. As an immortal that craves human blood (but wants to learn to curb a craving for it), what possible or plausible benefit is there for sitting in a classroom daily surrounded by fresh human meat? Would that not be like a struggling alcoholic hanging out in a bar in hopes of kicking an addictive behavior? Also…why do vampires need to wait for a lightning storm to play recreational baseball? Beat's me. Call me crazy, but the basic universe of TWILIGHT doesn’t hold up for me. I have no problem believing in the unbelievable in movies, but when individual films can’t hold up to simple scrutiny within its own logical rules, then I tune out. The central problem with TWILIGHT is that I never once bought into why one of the eternally damned personas would waste time with scholastic endeavors. Not only that, but if you were a vampire, would you not want to have a decent cover from society? Being incredibly pale skinned, cold blooded, and having a Bela Legosi stare does not lend itself to being inconspicuous. Plus, if you’re trying real hard to not give into drinking human blood, hanging out with young and fetching teen girls is not the best arrangement. It's bad enough having raging hormones, but adding a blood lust to that? Not good. Alas, TWILIGHT does not believe in logic. It’s more secure in being a disposable action-romance for the 12-16-year-old girl sect. Like a sleazy Harlequin romance novel, the film is about lust, not forbidden love, as the trailers for the film may let on. There is no real tangible love between the two diametrically opposite young kids; instead, they are attracted by what each other represents. The teen vampire wants the girl in the worst way, but he torments himself about the meaning of “wanting.” Does he want her for lunch or to be his steady girlfriend? Frequently, he laments to her about how much he needs to be with her, but his appetite for sucking her dry means that – dammit! – he must stay aware from her. The young girl – for some inexplicable reason – instantly falls for this lad. As a matter of fact, she is willing to go so far with this super-humanly dangerous monster that she does not care about the repercussions. But why? Really? Why would a fairly bright and levelheaded teen want to potentially be cannibalized and left for dead by such a loser? The plot is this: 17-year-old Bella (Kristen Stewart) has left her mom and stepdad back in Arizona to come and live with her semi-estranged dad (Billy Burke) in a cold and damp Pacific Northwest town. Her dad is the Police Chief of the town in question (Forks, Washington), which has a cozy population of 3100. Despite the fact that things are initially awkward between daughter and father, she does like being with him, mostly because he does not “hover” over her all the time (as told in a completely unnecessary voice over narration by Stewart). Bella attends her first day of class at a local high school and has the requisite run-ins with all of the various cliques there. One group of strangers, the Cullens, gets her to notice the most. They are seriously weird: most of them have skin so inhumanly light and pale that its no wonder that a teacher has not intervened and sent them to the nurses’ station for a check up. Not only do they look really dead, but they also stare at people in that zombified gaze that lends way too much attention. How anyone would not suspect this clan to be bloodsuckers is beyond me. One day in biology class Bella has a very peculiar “meet cute” with one of the Cullen boys, Edward (Robert Pattinson, perhaps most remembered for playing Cedric Diggory in two HARRY POTTER films, and who will certainly have a career at making teen girls swoon). Bella is partnered with the very odd Edward for a bio-lab, but he exhibits incredibly outlandish and bizarre behaviour around her. Not only does he, as stated, look like a vampire, but he stares at her so forcefully that he nearly breaks out into convulsions, almost like he's having a seizure. This guy, to any reasonable young girl, either appears to be a coke addict or a vampire, either of which would be bad news for any prospect of a normal relationship. There seems to be no conceivable reason for Bella to become smitten with this person. However, he is played by the annoyingly handsome Pattinson, and he is simply too unreservedly attractive to Bella, and the movie only reaffirms my longstanding belief that cute girls will always choose the most handsome and dangerous dude in the crowd that will cause her nothing but grief instead of nice and well meaning boys that possess no threat whatsoever. Despite their very odd introduction to one another, Bella and Edward seem drawn together. Edward exhibits the ultimate mixed singles to her: He frequently tells her that he wants to be by her at all times, but he can never be with her for undisclosed reasons. Bella falls for Edward because he maybe represents what she can’t have...I guess. Things get really dicey one morning when an out of control truck nearly slams into Bella. Edward saves her, in broad daylight and in front of hundreds of witnesses, by jumping in front of the truck and stopping it with his bare hands (conveniently, not one witness films footage of it on a camera phone, nor does anyone wonder why there is a hand-shaped dent in the vehicle). Bella, at least, starts to suspect that Edward is not normal. The film’s most insidiously and unintentionally funny beat occurs when she decides to do some research to discover Edward’s secret. She goes to the library, does some Google searches, which all culminates in a close up shot of her bugged out eyes with background music swelling to shocking crescendos: Like, ohmygawd, he’s like soooo a vampire. Now, any normal person would be able to discern with limited effort that Ed is a member of the undead. Yet, TWILIGHT operates so nauseatingly on the premise of “The Idiot Plot Syndrome” that it turns a smart character like Bella into a moron. Sigh. Needless to say, the two begin an obviously troublesome relationship, the kind where two people want each other really bad regardless of the consequences. Edward wants to love and have a respectful relationship with Bella…buuuut he also struggles with whether to turn her into his next meal. Bella, on the other hand, does not seem to care (?) about being served up on a platter for Edward’s ravenous cravings because…dammit…he’s dreamy. Things go a bit smoother for the couple when Edward invites her home to meet his family, where we learn that he and his clan are vegetarian vamps, meaning that they eat only animals and not humans (good for Bella, bad for PETA). Unfortunately, just as things look like they are going to work out for Ed and Bella, a truly dastardly and deadly non-vegetarian vampire named James shows up that insatiably wants Bella to be his next victim. Cam Gigandet plays James, the same actor who played a teen badass from NEVER BACK DOWN. I still think that he is the love child of Brad Pitt and Paul Walker. Director Catherine Hardwicke (THIRTEEN and THE LORDS OF DOGTOWN) does manage to generate some thanklessly decent performances here. Stewart in particular, who was memorable in films like INTO THE WILD and PANIC ROOM, lends a grounded vulnerability and low-key intensity to the otherwise ridiculous proceedings. She is able to capture the awkward inflections of her guarded teen character and embody her angst without it becoming overbearing: She has a lovely, naturalistic screen presence. Her scenes with her on-screen father have a sly charm and veracity. I also appreciated how the teen characters polluting TWILIGHT are played by age appropriate actors, which is a trend that I hope that other adolescent-centric films will follow. As much as I liked Stewart’s easy-going and affable presence in the film, the rest of TWILIGHT flounders around her. At $37 million dollars, the film is decidedly low budget…and it shows: Scenes with Edward and other vampires running up mountains, trees, and other terrain look egregious fake and flimsy. The climatic action set pieces pitting veggie-vamps versus flesh-hungry vamps is unremittingly a ho-hum affair that culminates too quickly and with little tension. It’s hard to drum up any level of excitement or dramatic tension here when TWILIGHT breaks a lot of movie laws when it comes to vampires. Nothing can really hurt these creatures (even when sun hits them, it makes their skin look like sparkling diamonds, which is beautiful to Bella). Seeing as vampires are mostly invulnerable in the film, they pretty much lack interest altogether. And don’t get me started again on that whole vampire baseball scrimmage? Why must they only play during lightning storms? I’m lost. The villains themselves in the film are so lacking in design, execution, and payoff that they inspired more yawns then thrills. They are almost a non-entity in the film and curiously show up when the script deems it fitting. They are too loosely developed, as are a pair of enigmatic and ill-defined supporting characters, two reservation Indian friends of Bella and her father that – as far as my research goes – are supposed to be werewolves, but its never satisfyingly dealt with in the film. I also did not quite understand why the villainous James would waste his time searching for Bella to sink his teeth into when any other mortal in the small town would suffice. Were there no other attractive girls at the high school to become his next unwitting victim? The there is the Edward character himself, as overplayed to the hilt at times by Pattinson, sometimes to the point of laughable farce. When the actor initially shows his inner torment while trying to deal with what to do with Bella in that biology class, it’s so unintentionally ham-infested and played with such obviousness by the actor that one chuckles more than recoiling in terror. He plays Edward as such a revolting sicko at first that it never once feels likely that Bella would fall for this creep. It’s clear that Pattinson was hired for looks first and talent a very distant second. A lower key approach would have been so much more acceptable here with Edward, but Pattinson’s work is too schizophrenic. Of course, maybe my criticisms don’t matter. TWILIGHT is absolutely critic proof for its target teen demographic. The film has emerged as such a smash hit that plans for the sequel, NEW MOON, has already started. It’s too bad, because to the agnostic appreciator of Stephenie Meyer’s work, TWILIGHT emerges as a disposable and anaemic teenage romance that never really sinks its fangs into a memorable story. Perhaps even more unsettling is the central creepy and sleazy themes of the film, which is all the more unsettling considering the potentially young filmgoers that will flock to the flick: Lust for someone overwhelms all other emotional drives; if you want the person bad enough, the repercussions don’t matter at all. 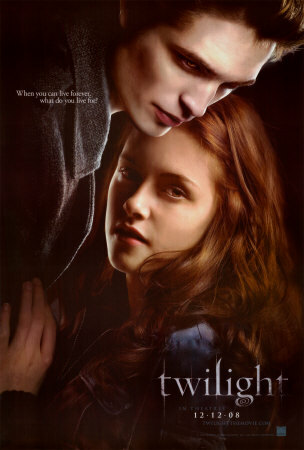 TWILIGHT has insatiable yearning between the boy and girl, but no real passion or affection. I mean, seriously...I ask again...why would Bella want to be with Edward? Does she want to be eaten and have her blood drank? Furthermore, has she never seen a vampire film? She must know how hopelessly depressing their lifestyles are, so why would the thought of becoming another member of the undead be so cool? Oh, right…because Edward is so damn dreamy…it would be a curse alone not to try to bed him. It’s funny, but for a film like this that claims to have elements of romance, love appears to be all-but-vacant.